Does Belgian chocolate live up to its hype? My answer: Absolument or absoluut (“Absolutely” in French and Dutch)! 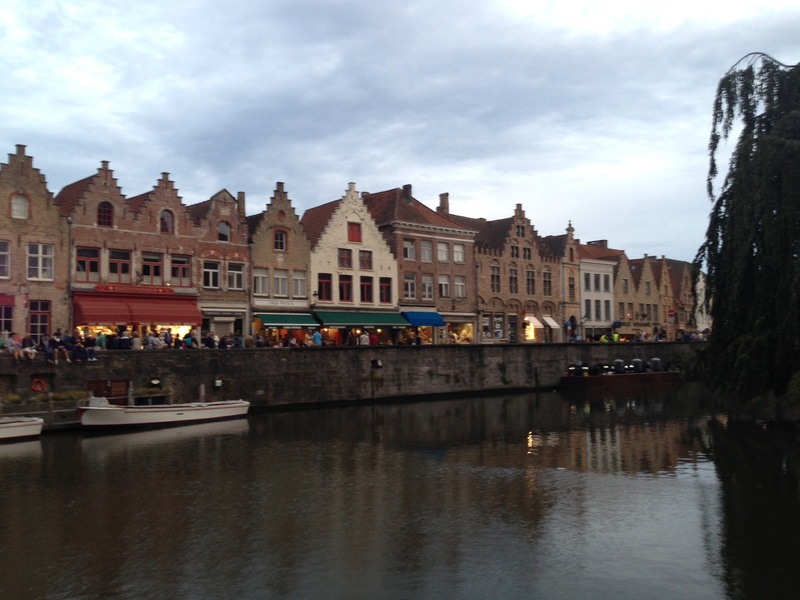 I’ve had the privilege of scouring Brussels and Bruges (Brugge) for chocolate. I’ve tried hot chocolate (see my post about my search for the best), chocolate glace (ice cream), truffles, bar chocolate, ubiquitious chocolatiers that cater to tourists, boutique chocolatiers with designer, haute chocolate. I conclude that Belgium is a destination for amazing chocolate. Now, I’d be remiss in not pointing out the irony that what we call Belgian chocolate is sourced from outside Belgium. It’s akin to calling a wine a Napa Cabernet when its grapes actually were grown in Brazil and shipped to a winery in California. Belgian chocolate products originate as cacao beans from a wealth of other geographies – throughout the criollo and forestero (the two varieties of cacao) cacao producing regions of Africa and South America. But those countries themselves do not have the breadth and depth of expertise in roasting, refining, purifying the cacao, nor the artistry, of Belgium and western Europe. As someone who has traveled throughout cacao-producing countries in South America, I can say that I have tasted quite good, locally manufactured chocolate products, particularly in Peru; yet I haven’t seen quite the smoothness and richness that the Belgians, French, or Swiss extract in their retail and boutique chocolate products. What do I mean by that? In general, even the darkest chocolate noir from Belgium will have a smooth bite and creamy mouth feel, while chocolate produced elsewhere with a high cacao content (above 70%) tends to be chalky, grainy, and not smooth. In Belgium, I have yet to be disappointed. 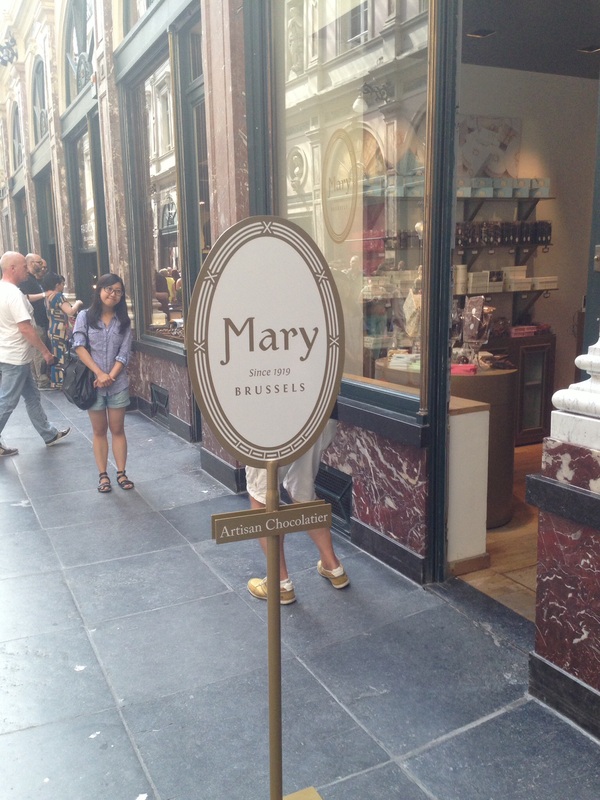 Mary: Mary purports to be the royal chocolatier of Belgium. Walk into its signature store inside the Galerie Hubert, a high-end shopping hall in the heart of Brussels that is home to several of the best Belgian brands, and you’ll feel that you have stepped into a dainty gallery of perfect chocolate on display. Though it has an impressive and oh so delicately flavored truffle case, its primary retail products are its Langues du Chat (Cat’s Tongues) of solid chocolate and solid chocolate bars and squares, each individually wrapped and presented in a variety of elegant and simple packaging that is perfect for gifts. They offer variations of dark chocolates, as well as flavored squares, such as orange toffee and milk chocolate with cinnamon. It truly is chocolate at its purest and finest. Neuhaus: With retail outlets in over 50 countries, Neuhaus has become an internationally recognized Belgian brand. I actually avoided Neuhaus during most of my visits to Belgium because of this fact. Perhaps it was a bit snobby and premature to assume that just because they went corporate – not so much as Godiva, but close enough for me – their chocolate wasn’t a must-try. A recent gift of a large Neuhaus ballotin at the holidays changed my mind (see the featured image, above). Every single chocolate – whether a traditional praline (not necessarily hazelnut or almond as we tend to assume), nougatine, solid chocolate, truffle, or a more distinctive creation, such as their signature Tentation (chocolate exterior, with a layer of “nougatine biscuit” and cream or ganache filling) – was smooth and delicious. Pierre Marcolini: Another recognizable Belgian brand from a celebrated modern chocolatier with a bit shorter history than the other two, it features slick, modern, dark brown packaging. It’s like the Armani of chocolate. Their flavors lean a bit more towards the exotic. They are quite expensive and have a narrower range of products, but they are intense and yet artisanal. I would call them the perfect corporate gift, as their brand and chocolates exude masculinity and an almost architectural, eye-catching precision. I realize that description doesn’t make them inviting; they are delicious – I once received them myself as a gift in the U.S. and savored every last bite! I just think of them as more showy and less distinctive and inviting, as say, Mary (above). The rest: Chocolate shops are everywhere in Belgium, particularly in tourist-friendly areas such as the Grand Place in Brussels or the old city in Bruges. The quality and uniqueness of their chocolates isn’t up to par with those I described above, and typically, chocolates are not made in-house, but rather purchased from a mass distributor by shop owners and then resold, as I learned from a local businessman in Bruges. Still, I would not turn those chocolates away! Often, the beauty of these stores is that many of them, like Le Gourmand Belgique, sell self-service chocolates by weight, so you can enjoy filling your bag with as many bulk, mix-and-match treats as you wish. It’s a great way to spend those last few Euros you didn’t really want to come home with or exchange for other currency. Truffles, chocolate-covered toffees, pralines, bark, and even bricks of marzipan (my favorite non-chocolate candy) are on display. And yes, even some of these shops have their own moulded chocolate creations, ranging from the kid-friendly (lollipops, cars, animals) to the not-so-family-friendly, as are some of the interesting items in the display from a Bruges window front shown below. 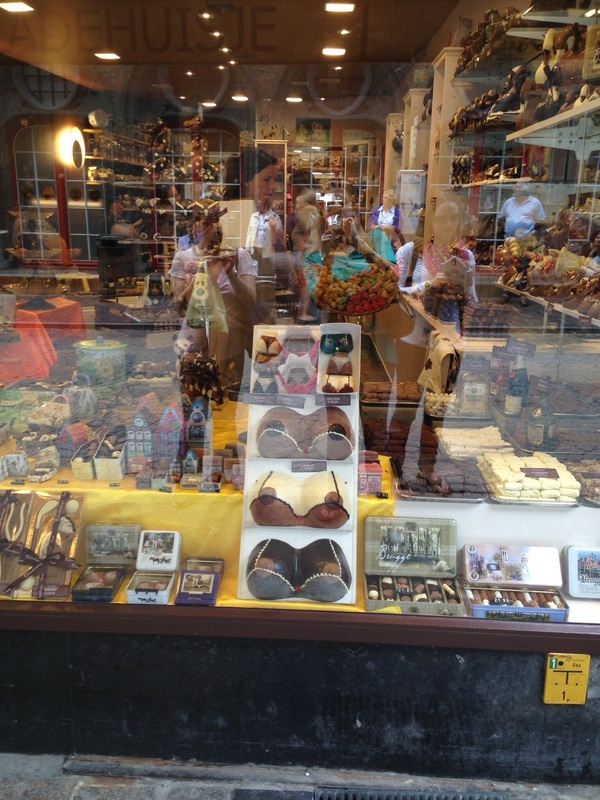 One of dozens of chocolate shops in Bruges with, ah, creatively moulded chocolates. Yes, those are breasts, if you thought your eyes were deceiving you. I did a double take when I saw them in person as well. Apparently you can make anything out of chocolate…If you’ve ever visited Bruges, you’ll not be surprised by this display. Bruges is a lovely, though quite quirky and, at times, macabre, city. Keep Bruges weird! 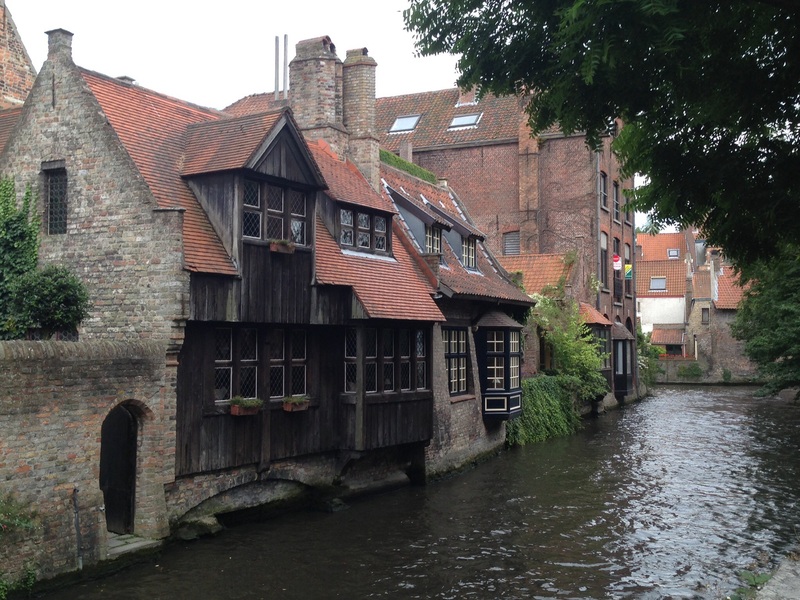 Bruges (Brugge), a lovely – if not weird – city! !